Length: 27.5 mm (note new longer length). This miniature ER10250 1/2 AAA Lithium Thionyl Chloride battery is ideal for wireless alarm systems and can be widely used where miniaturisation is driving down the size of applications. 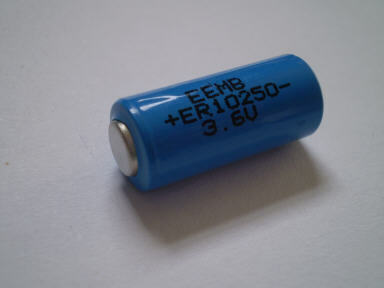 Covert surveillance devices are a perfect example of an application for the combination of high energy content and small size delivered by this ER10250 1/2 AAA Lithium Thionyl Chloride cell. Versions of this ER10250 1/2 AAA Lithium Thionyl Chloride cell are available to order with a wide variety of solder pins, solder tags, axial wires, and polarized solder pins. Visit here if you need the bare version of this cell with solder pins/tags. Click here..... for a full specification.